If you long for a controller that can equalize the torque range in all of your tjet chassis, this is the controller for you. 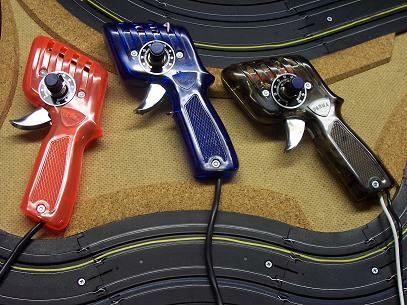 It will allow you to customize the controller so that you get the torque in the same part of the trigger pull, no matter which chassis you pull out of the box. You know how some cars respond right at the top of the trigger, while others don't respond until you're nearly flat out? Now you can adjust to get the same feel in the controller for every chassis in your box. These can be built for sale to anyone who's interested. If you've got an idea that you'd like to try, let me know. I'm here to serve. Not everyone feels savvy enough to break out the soldering iron and wire up one of these. They'll be priced on a case by case basis. All materials are quality components. It's all inside the case, so it's unlikely that you can break it by dropping the thing. You'll like the self contained part. One try and you'll be hooked. If that's the case, I'll be glad to help you with that as well. Leave me a message in the Guest Book or email me using one of the links on this page. Again, I'm here to serve. Were it not for Scott Dunlap, I would not even have started this project. He gave me the components to build this first controller. I'm working on some for friends in the club right now. Place your order today. Or, email me at RMickey4@msn.com and find out how, for just twenty-five bucks, plus shipping, you can get the parts to solder together your own VRC, Variable Resistance Controller. The kit comes with a schematic, a 50 ohm potentiometer with knob and dial, a 50 ohm resistor and a microswitch for full punch in the straights. 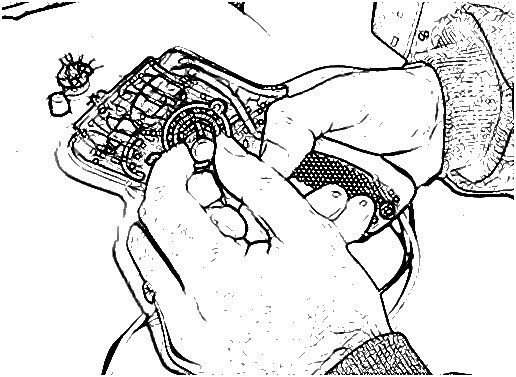 You provide the econo controller, the extra wire and the soldering skills to put it all together. For easy payment you can use Paypal sent to my email address. I'll ship the same day, if possible, or the next day. It takes about 2-3 business days to receive it via priority mail. This is a simple design shown to me by Scott Dunlap. This is an entry level controller with adjustability built right in. It incorporates a stock 60 ohm resistor with a 45-50 ohm potentiometer wired in. This gives a total range of 60 to 105 or 110 ohms. I also added a full punch button to give the controller full power at maximum trigger pull. This was all built on a Parma Econo frame. Leave me a note in the Guest Book if you have questions. Better yet, email me at RMickey4@msn.com and I'll get right back to you. 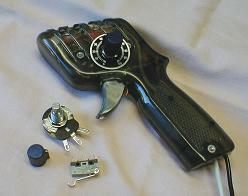 No switches, just a trigger and a knob to adjust for the proper feel. I could've made it more elaborate, but there's no need. There isn't a limit to the range of adjustability. Just change the value of the resistor or the range of the potentiometer and you can customize for nearly any application.